This is a basic easy meatloaf recipe, delicious, and one of the best meatloaf recipes you will find. Meatloaf is one of everyone’s favorite comfort food recipes and this one won’t disappoint. You’ll want leftovers. They are great sliced into a sandwich. Soften the bread crumbs in the milk for a few minutes, then pour off the excess milk. Combine the 3 meats and mix well. Add all other ingredients and mix until thoroughly combined. Place in large loaf pan, 2 smaller loaf pans or shape into loaf shape and bake on flat baking pan. Bake for 1 hour at 350° or until browned and fully cooked inside. You can use all beef, but the pork and veal combination with the beef add extra flavour and tenderness. All are great protein foods. Top with 1/2 cup tomato sauce or ketchup for added flavor. Or kick it up a bit with some salsa. A sandwich made with leftover meatloaf and a little butter and mustard is one of my favorite lunch treats. Don’t you just love two for one deals? Lean ground beef is a wonderful protein food and turns this into a pretty healthy recipe. If you want to create a very low fat meat loaf, in addition to the lean ground meat, use a double loaf pan. It drains the fat off the meat loaf as it cooks and keeps it away from the meat. Meatloaf is a pretty good diabetic recipe. Although it contains some bread crumbs, the rest of the ingredients are quite low in carbs. 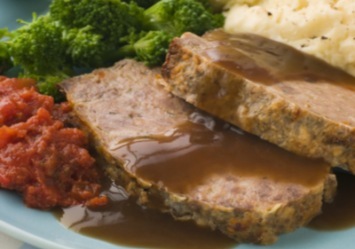 If you like this easy meatloaf recipe, you will probably love our oats meatloaf recipe too. Find it here. We tried this recipe tonight and it was just ok. My 11 yr old daughter said the last meatloaf we made was better. This recipe is lacking a bit of flavor. I did add Worch. sauce and some italian seasoning. Our family rated this recipe a 3.5. Thanks for your comments. Everyone likes different flavors. Feel free to add what your family prefers. Love this recipe, it is delicious. Wondering if you bake it in muffin tins, would you need to adjust the temp. or cooking times? Adjust the cooking time for sure as there is far less volume than with one large meat loaf. Try 20 to 30 minutes at the same temperature. Thank you for your input. I went ahead and used the muffin tins. I found them to be a little hard to get out of the tins, even though I had sprayed them with Pam. I did cut the cooking time to about 35 minutes. They are handy to use this way, but I don’t think I would do it again. Combine above ingredients (less topping) and shape into a loaf. Line rectangular pan with tin foil. Place small rack on top and cover with tinfoil and poke holes in tin foil. Add loaf. Spread catsup and sprinkle with sugar on top. Cook at 400 degrees for about 1 hr. or until done.